After blowing our minds with vapor-producing monsters like the TFV4, TFV8 and Skyhook RDTA tanks, SMOK is now showing mouth-to-lung (MTL) vapers some love with the new Spirals family of tanks. Its newest member, the SMOK Spirals Plus is a sub-ohm tank that promises amazing flavor and decent vapor production as well. It’s basically the best of both worlds, or at least it tries to be. The Spirals Plus tank comes in the usual SMOK packaging – a small, rectangular cardboard box, with a paper wrapper featuring a stylized photo of the device on the front, and a short description, kit contents and company information, on the back. 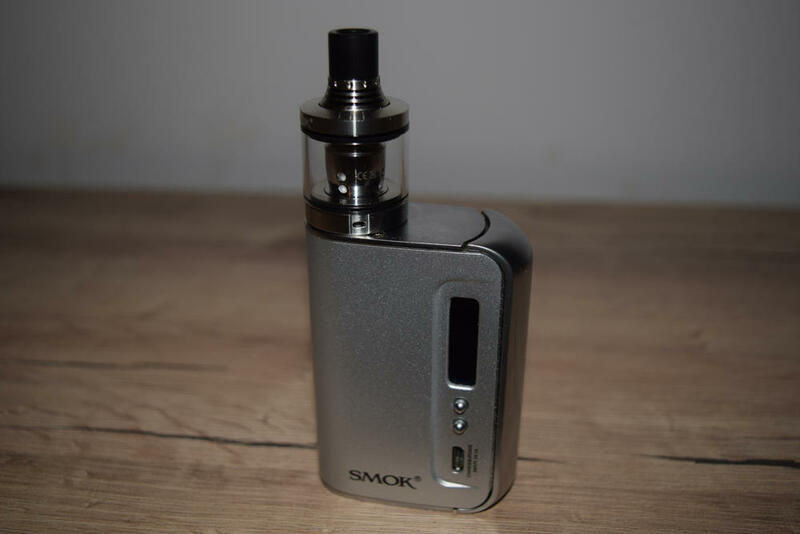 The starter kit contains the assembled Spirals Plus tank – with a preinstalled 0.6Ω coil-head – a spare glass tube, an 0.3Ω coil-head and a cool single-coil RBA deck, all placed in a foam holder. Underneath that, you’ll find a handy user manual and a bag of spare parts that includes o-rings, spare screws for the RBA base and some organic cotton, also for setting up the RBA base. As we’ve come to expect from the guys at SMOK, this is a very generous package for the money (around $20). I am particularly happy that they included a rebuildable deck which allows you to use the device even if you’re not crazy about the Spirals coil-heads, which I am not, but the spare glass tube is a great addition as well. 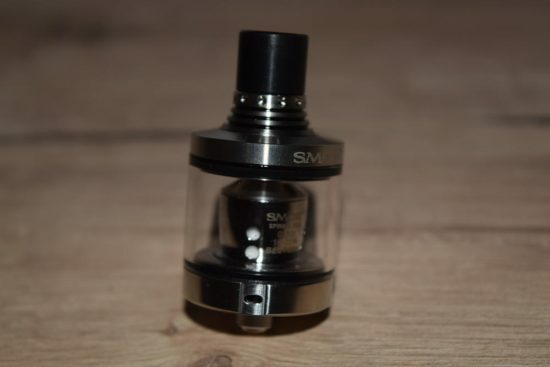 The SMOK Spirals sub-ohm tank measures 24.5 mm in diameter, 48 mm in length – from the base to the top of the long Delrin drip tip – and holds around 3.5 ml of e-liquid. 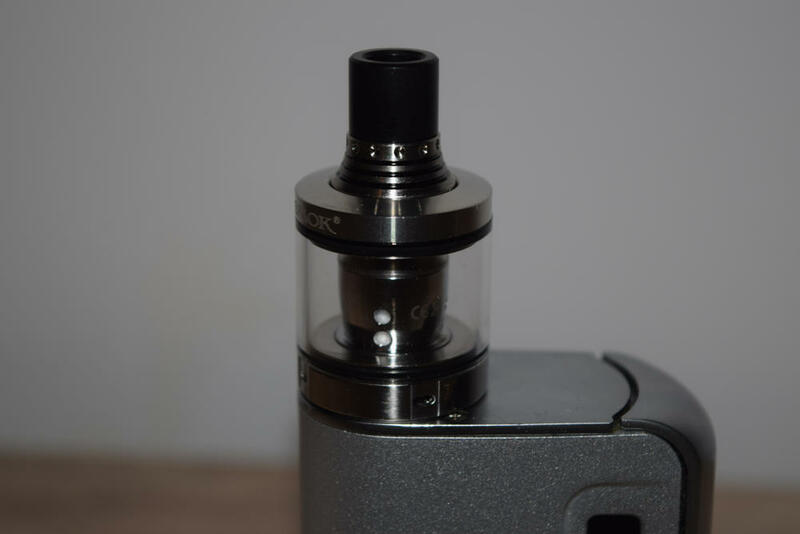 The official SMOK website shows a capacity of 4 ml, but I couldn’t fit more than 3.5 ml without it overflowing over the fill port. 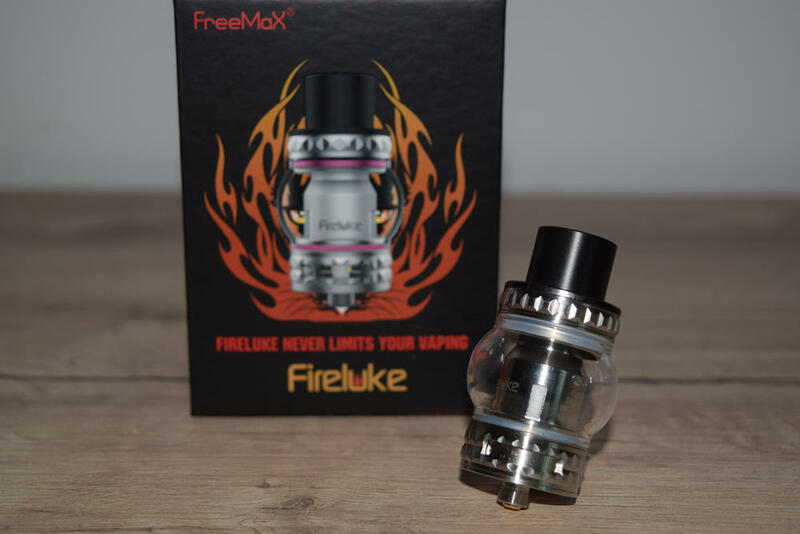 The tank is primarily made of stainless steel and glass, and is available in five different color options – stainless steel and black, red and black, blue and black, green and black, and gold and black – all of which come with matching o-rings. The overall design of the Spirals Plus is very similar to that of the original SMOK Spirals tank, the only noticeable difference that the newer version is slightly stubbier, which means it can hold double the amount of e-liquid. Other than that, the two tanks are pretty much the same, and work with the exact type of coil-heads. One of the first things you notice about the Spirals Plus is that it looks longer than it actually is, because of the protruding drip tip holder and the unusually long removable drip tip. 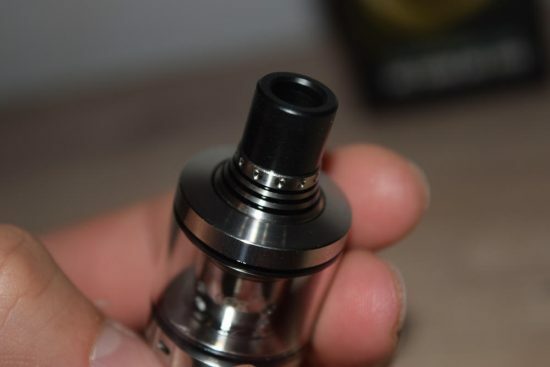 While the design of the cup holder kind of makes sense, as it also doubles as a cap for the top fill port, and you need to be able to get a good grip on it to unscrew it, the drip tip is unnecessarily long, in my opinion. The good thing is that you can just take it out and replace it with any other 510 drip tip. Otherwise, the Spirals tank doesn’t really have any innovative features that we haven’t seen before. It’s a three-piece design, with the coil heads or RBA section sitting in the middle of the base and screwing into the short chimney at the top. 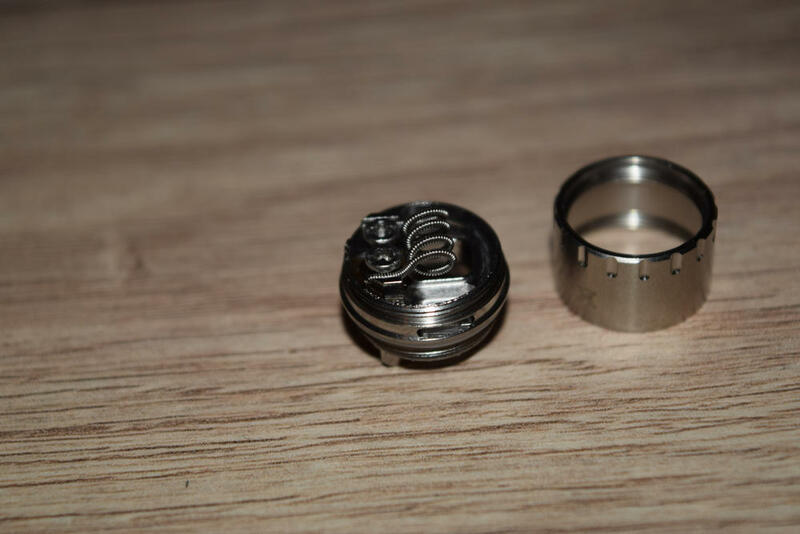 It only features bottom airflow, with the detachable airflow control ring turning clockwise and counterclockwise to open and close the four small air slots. It has stoppers on both sides so you only need to turn it a little bit. 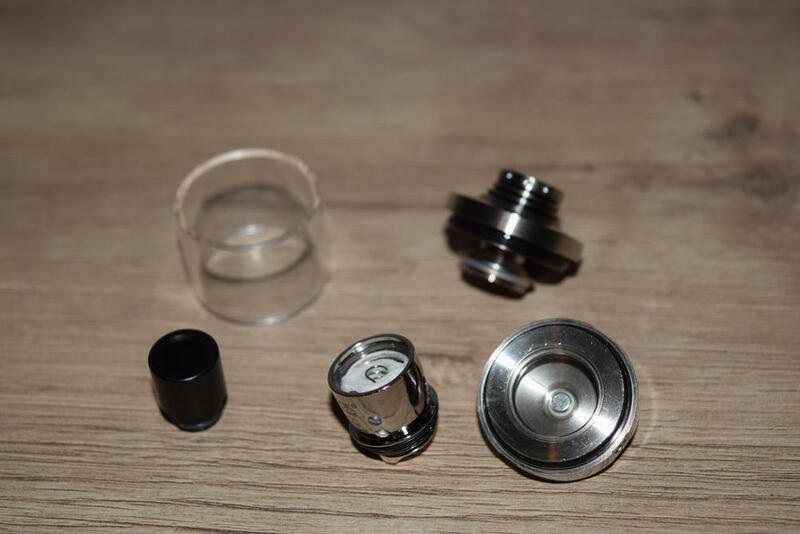 The top filling system can be accessed by unscrewing the drip-tip holder. Once you’ve taken that off, you’ll see two fairly large fill holes leading into the tank itself. You can fill the Spirals Plus with pretty much anything, from unicorn bottles to droppers and syringes. If you’ve used the originals SMOK Spirals, the coils that come with the Spirals Plus will look very familiar. That’s because they are the exact same ones. 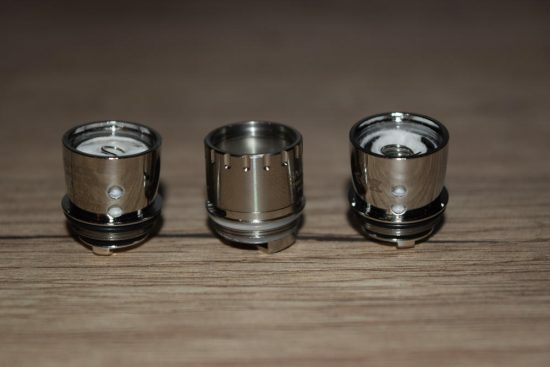 They are smaller than the ones of the TFV4 tank, and much smaller than those of the TFV8, but that’s to be expected, considering that the Spiral Plus is basically a mouth-to-lung tank meant to bring out the flavor of the e-liquid rather than create insane amounts of vapor. Quality-wise, the Spirals Plus is pretty much flawless. The materials are top quality and the threads are very fine, so everything fits the way it’s supposed to. However, as I mentioned, it doesn’t really come with any groundbreaking features. It’s just a really well-made tank that does what it’s supposed to without blowing your mind. 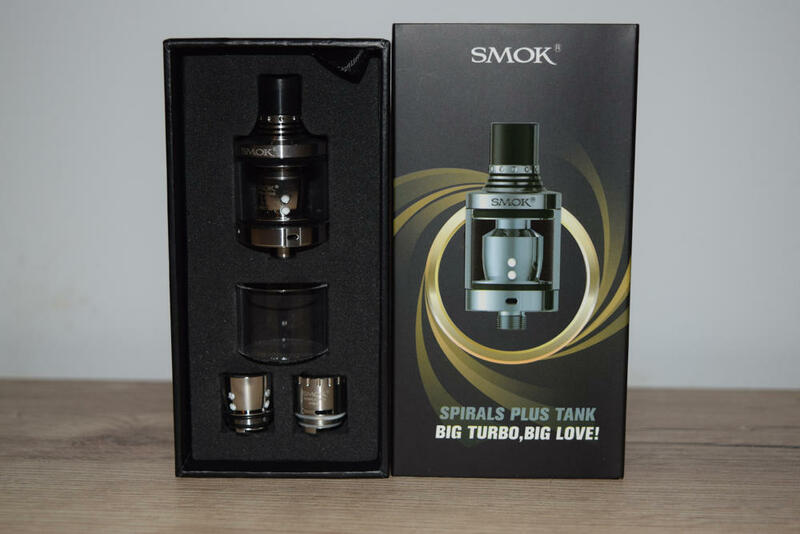 Getting the SMOK Spirals Plus ready for your first vape is surprisingly simple for an advanced tank. The 0.6Ω coil-head even comes pre-installed, so all you have to do is pour in some juice and you’re good to go. But I recommend taking it apart and giving it a good wash beforehand. It’s good hygiene and it gets rid of any leftover machining oil. 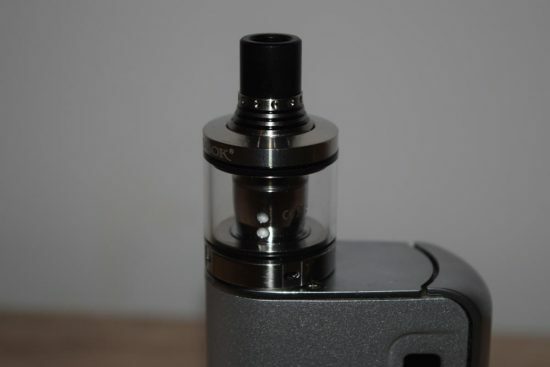 Once everything is nice and clean, all you have to do is place one of the coil-heads in the atomizer base – it doesn’t screw in, so don’t even try – and then slide over the glass tube and the top part of the tank, which you do have to screw on to the coil-head. Then just remove the protruding drip tip holder and add juice. 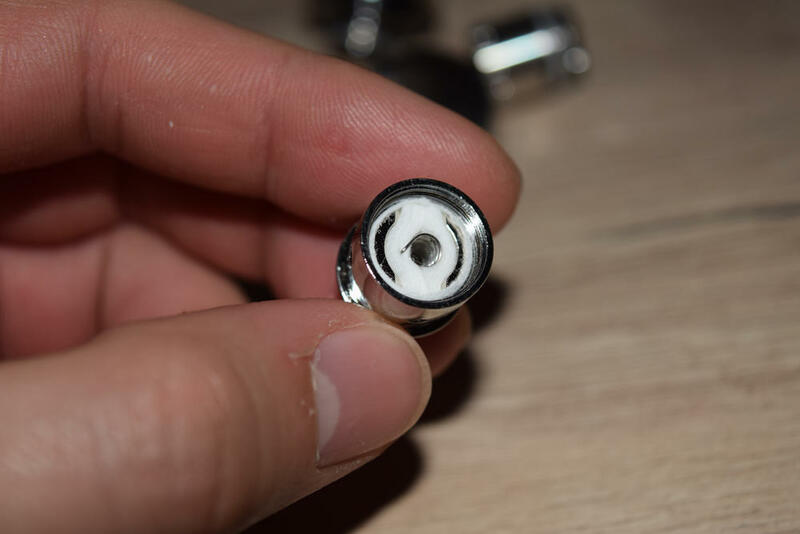 To ensure that the cotton wicking around the coil is nice and saturated, I recommend putting a few drops of e-liquid on the coil-head before installing it. That’s about all it takes to get the Spirals Plus ready for vaping. After that, all you have to do is adjust the airflow to your personal preference. Considering all four slots are very small, I like to keep them wide open to get an airier draw. The SMOK Spirals Plus is advertised as a sub-ohm tank, but if you’re looking for something that puts out crazy clouds of hot vapor, you’re barking up the wrong tree. This is more of a mouth-to-lung tank aimed at flavor chasers who also enjoy a decent amount of vapor. I like to think of it as a compromise to try and offer vapers the best of both worlds. The two included coil-heads offer a slightly different vaping experience. The 0.6Ω one is designed for a pure mouth-to-lung vape. It has a small diameter coil wrapped in plenty of organic cotton, so the draw is going to feel very tight, and the vapor production pretty unimpressive. However, the flavor you get with it is absolutely phenomenal, and the throat hit is particularly strong as well, even with low-nicotine juice like 0.3 mg/ml. 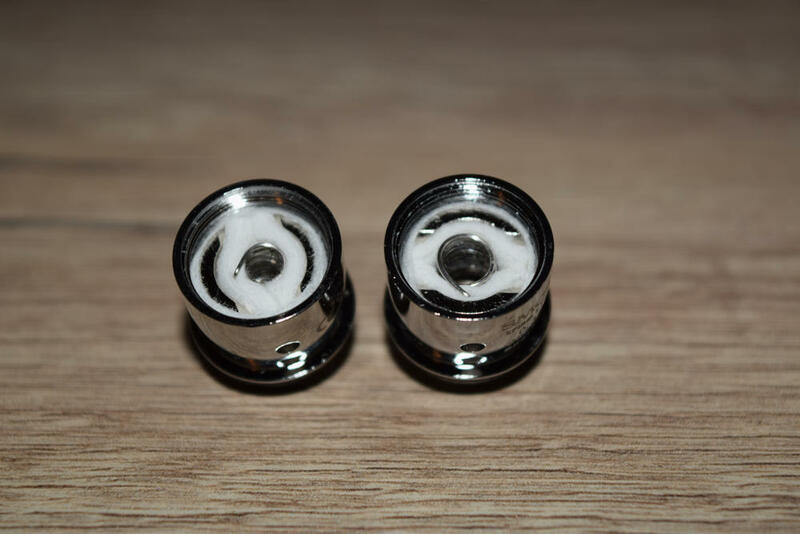 The 0.3Ω coil-head – the one I have been using most during testing – also puts out great flavor, but the vapor production is much more decent than with the larger-resistance one. If you don’t mind an airier draw – which can be adjusted with the airflow control ring on the bottom of the tank – or if you just like your vapor on the warm side, this is probably going to be your favorite of the two coil-heads. I am not a big fan of mouth-to-lung vaping, so I wasn’t particularly impressed with the performance of the two Spirals Plus coils. They’ve been getting a lot of praise from MTL vapers, but I just love hot vapor and lots of it. But, luckily, this SMOK tank also comes with a handy RBA base that you can use to try out all kinds of coil builds. Even though you can only fit just one coil in it, there’s plenty of space for pretty much any type of exotic build, so you should be able to get the resistance pretty low. The airflow is perfect for MTL vaping, but if you prefer an airier draw, it’s going to feel a bit restrictive even with all four slots wide open. The holes are just too small compared to other advanced tanks, and even with the 0.3Ω or the RBA, I always felt the need for a bot more air. As I said, if you prefer a tighter draw, the airflow will seem perfect, it’s just a matter of personal preference. 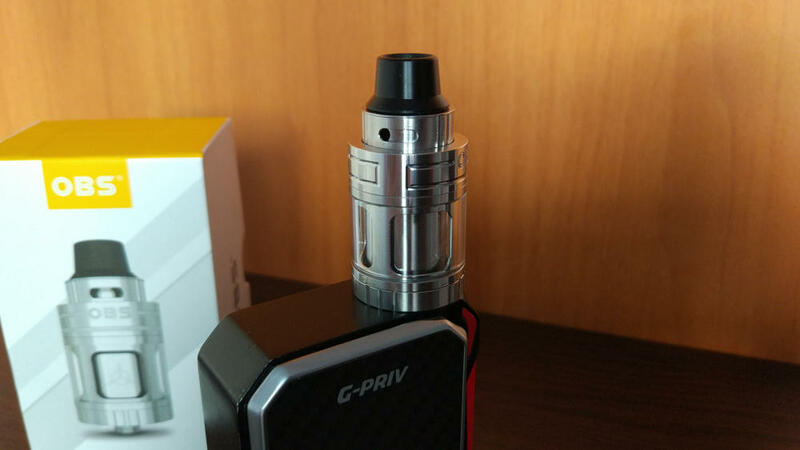 I didn’t have any leaking issues with the SMOK Spirals Plus during the one week testing period, which is always a big plus, considering that leaking is the bane of pretty much every vaper I know. Oh, I almost forgot one of the biggest pros of the Spirals Plus – the low e-liquid consumption. Vapor beasts like the SMOK TFV8 may turn a room into a foggy sauna with just one draw, but you have to pay for that in juice. You can go through a full tank of e-liquid in just a few minutes, while a full Spirals Plus is guaranteed to last you a good few hours with any of the two coil-heads that it comes with. The SMOK Spirals Plus is a solid tank, but also quite different than what I’ve come to expect from the Chinese manufacturer. I was used to its big family of cloud machines, but the Spirals and the new Spirals Plus are intended for flavor chasers rather than cloud chasers. They do however produce significantly more vapor than most mouth-to-lung tanks I’ve used, so I guess they’re more of a compromise than classic MTL devices. 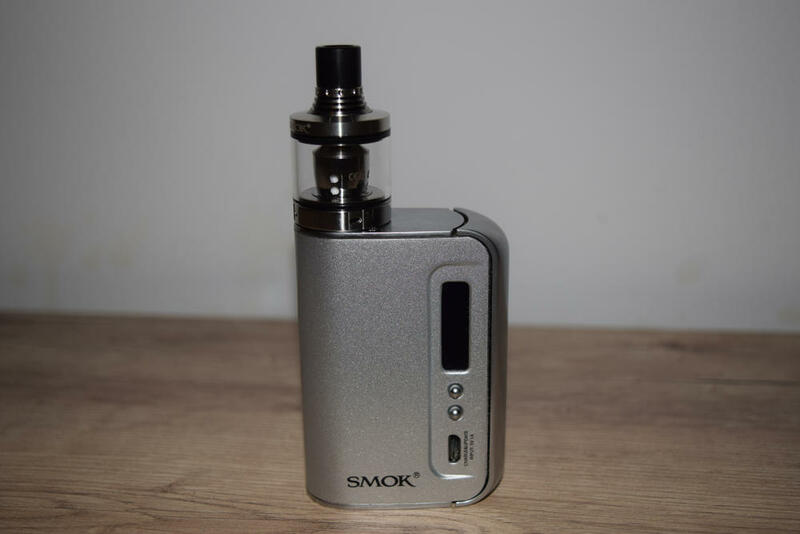 The build quality is top notch, as we’ve come to expect from SMOK, the kit is about as generous as you can expect for a tank, and the price is pretty decent as well. So if you’re looking for a new tank that brings out the best flavor out of your e-liquid and put out decent vapor, I would definitely recommend the Spirals Plus. 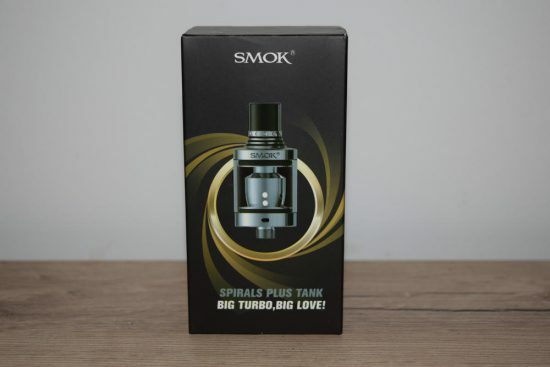 The SMOK Spirals Plus sample was sent to me specifically for the purpose of this review by Smokstore.us.